Recently, Washington Gov. Jay Inslee and Attorney General Bob Ferguson took a stand against the Department of Energy's "wait and see" approach toward the cleanup of the Hanford nuclear site. Looking out for the best interest of the Northwest, they unveiled a plan to improve accountability of the cleanup of Hanford. Gov. Inslee created a deadline for Energy that requires waste is removed from leaky single-shell tanks by 2040 (26 years might seem like a long time, but beats not having a deadline at all) and presented a schedule to complete the waste treatment plant. At the same time, Energy released a counterplan, full of empty promises, that doesn't protect northwest communities or the Columbia River from the dangers of Hanford's nuclear waste. Hanford is the most contaminated site in the western hemisphere, where the federal government produced plutonium to fuel our nation's Cold War nuclear arsenal. Energy wants to develop milestones for cleanup on a rolling basis as technical issues are resolved. We don't have time to waste on Energy's "wait and see" approach. Residents of the Tri-Cities depend on the Columbia River, just downstream from the Hanford nuclear site, for their drinking water. 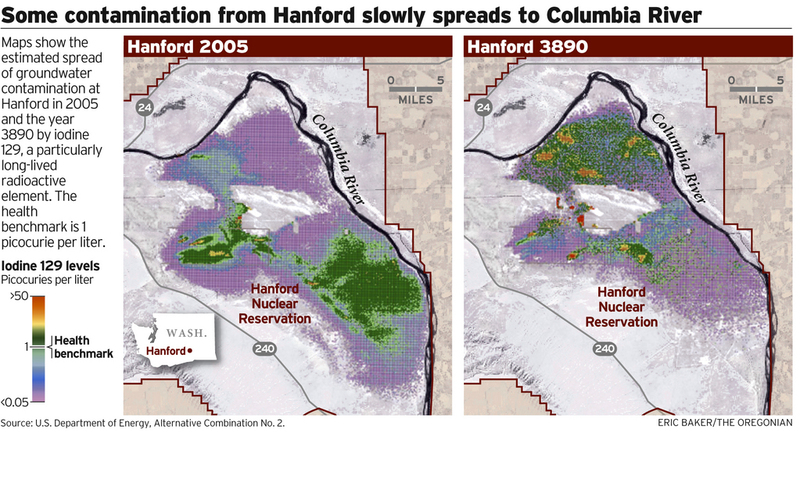 This area of the Columbia River, known as the Hanford reach, is the most productive spawning ground for endangered Chinook salmon on the Columbia River, producing 52 million juveniles every year. Public lands bordering the reach are home to 48 rare, threatened or endangered species. Leaving pollution in the leaking tanks, to slowly seep into the Columbia River, puts the water supply and salmon at risk. And Energy doesn't have a good track record when it comes dealing with the public's concern in a timely fashion. For example, more than a year ago, Energy revealed that a double shell tank, AY-102, was leaking nuclear waste. They don't plan to begin removing waste for two more years. That's three years while we wait to see whether the tank can withstand the heat and corrosion of the waste inside. Their plan fails to protect public health and was so inconsistent with public sentiment that Washington issued an administrative order requiring pumping of nuclear waste from AY-102 by September 2014. Just days later, noxious gases at the tank farm sent workers to the hospital. The Hanford Advisory Board and watchdog groups like Columbia Riverkeeper and Hanford Challenge have brought concerns about worker safety at the tank farms to Energy's attention. But it is obvious Energy is not taking the necessary steps to watch over their contractors and protect employees. It seems like common sense: Energy needs to take more aggressive action to immobilize Hanford's nuclear waste and to protect workers, tribes, citizens of the Northwest, and the environment. Later this month, we all have an opportunity and a responsibility to give the Energy our two cents about Hanford cleanup and to encourage Washington state to hold the Energy accountable for keeping nuclear waste out of the Columbia River. The Hanford State of the Site meetings are scheduled for 6pm April 16 at the Portland Doubletree and April 17 at the Hood River Best Western. See you there.